Thermage® Inc. of California, USA (now part of Solta Medical) was founded in 1995 by Dr. Edward W. Knowlton, the inventor of the Thermage ThermaCool™ device. The original ThermaCool™ Radio Frequency (RF) device was launched in the UK in 2004. Subsequent developments over the years have now produced the Thermage NXT® in 2007, followed by the Thermage CPT™ system in 2009 which incorporates proprietary Comfort Pulse Technology™. The Thermage system consists of one device platform with a large selection of single-patient treatment tips (i.e. face, body and eyes), each of which features a unique heating profile to target treatments for a specific area, including skin tightening, body contouring and the temporary improvement in the appearance of cellulite. The principle behind treatment is to tighten existing collagen and stimulate new collagen growth; immediate results are usually visible and continue to improve for up to six months. The use of RF technology means this can be used on all skin types (colours). Note: Since the release of the Thermage CPT™ System the Thermage NXT® is no longer available for purchase direct from the manufacturer in the UK, however you may still find UK clinics using this older device. When approaching a clinic for Thermage™ treatment, be sure to ask them which device they are using as this may have a bearing on your treatment options, comfort and results. The original ThermaCool™ system was a 330 watt, 6 megahertz (MHz) mono-polar (one electrode) radiofrequency device that used patented technology within its ThermaTip™ to deliver radiofrequency energy deep into dermal tissues. In developing the Thermage NXT® system, the manufacturers set out to improve treatment speed and overall effectiveness of the device which resulted in a system which treated up to 25% faster than the previous Thermacool machine. It delivered up to 400 watts at 6.78 MHz and included integrated cooling for added comfort. The Thermage CPT™ is now the flagship model from Thermage. In further developing the NXT system, the manufacturer sought superior results and greater patient comfort, as many had described treatment as quite painful. Hence they have introduced their proprietary Comfort Pulse Technology™ to this system and a vibrating handpiece for more comfortable treatments. The Comfort Pulse Technology™ is a new method of energy delivery for the device which interweaves pulsed radiofrequency delivery with cooling bursts mimicking that found with Transcutaneous Electrical Nerve Stimulation or TENS therapy, often used for alleviating joint and muscle pain or labour pains. It disrupts the brain`s neural response and thus is aimed at improving comfort during the Thermage treatment. The manufacturers have also redesigned the treatment tips so that they deliver better, uniform heat distribution, which leads to improved volumetric heating in terms of results for a treated area, i.e. a greater volume of tissue is heated to the target temperature, and greater comfort as the heating is more evenly distributed across the treatment area. Thermage Face Tip 3.0 (STC) for full face and neck, Thermage Tip 1.5 (ST) for smoothing and tightening the lips and the Thermage Eye Tip 0.25 (ST) for the eyelids. The body tips include the Thermage Body Tip 16.0 and the Thermage Body Tip 3.0 (DC) for body contouring, as well as the Thermage Cellulite Tip 3.0 (CL) for the temporary improvement in the appearance of cellulite. 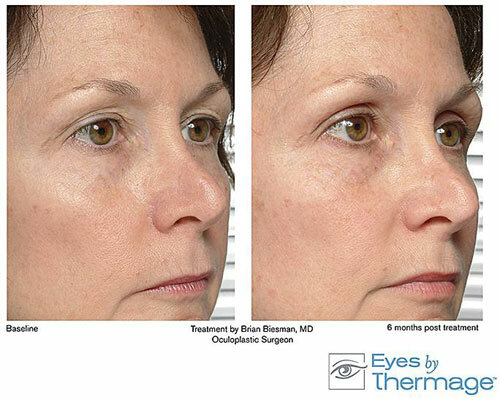 In November 2002, the ThermaCool™ system was cleared by the U.S. Food and Drug Administration (FDA) for non-invasive treatment around the eyes, and then in June 2004 for the treatment of facial wrinkles, followed by off-face for the non-invasive treatment of wrinkles in January 2006. Thermage is the first and only system to receive FDA clearance for non-invasive eyelid treatments which was received in June 2007. It is also FDA cleared for the temporary improvement in the appearance of cellulite (when combined with vibration). Before the treatment, an anaesthetic cream may be applied to the skin, as depending on the device used (particuatly the older devices) the sensation of the treatment has been likened to “snapping elastic bands against the skin”, which some people consider to be a little painful. With the Thermage CPT™ device this is likely to be deemed unnecessary unless you are particularly pain sensitive. A grid pattern stencil is transfered onto the skin of the area to be treated which the practitioner uses to place the device head on for precise treatment. This is then followed by a cooling gel. The practitioner will also attach a self-adhesive "return pad" to the patient’s stomach or back to allow a path of travel for the radiofrequency current back to the generator (i.e. to ground them). Each time the device touches the skin it delivers a controlled amount of RF energy and heats a large area of collagen in the deeper layers of the skin and underlying tissue; whilst also protecting the outer layer of the skin. This heating action causes deep collagen structures in the skin to immediately tighten. Over time, new collagen is produced by the body to further tighten the skin, resulting in healthier, smoother skin and a more youthful appearance. Depending on the size and location of the area to be treated, the procedure may take as little as 20 minutes or up to two hours. Unlike many procedures requiring four or more sessions, most Thermage CPT™ patients benefit from a single treatment. Your practitioner will determine the course of treatment that is right for you. Commonly used to treat the forehead (lift brows and tightens forehead skin), under the eyes (thickens skin and tightens and lifts the upper cheek skin), cheeks (lifts slightly and diminishes enlarged pores), mid-face, jaw line (diminishes jowling and sagging along the jaw line), and the neck (tightens skin and diminishes wrinkling of the neck). Also for body contouring, such as tightening in the abdomen, and reducing the appearance of cellulite. 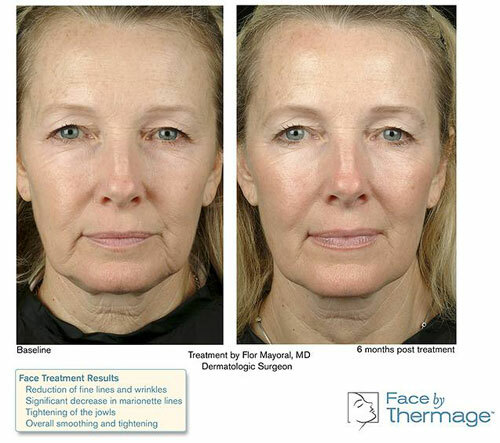 Visible results following a Thermage CPT™ procedure are often immediate and improve over time. Measurable tightening and contouring improvements appear gradually over a two to six month time period following a single treatment session. Results may last for years depending on the patient`s skin condition and natural ageing process. No, there is no pre-procedure preparation. With little to no downtime, most people can return to their regular activities immediately following treatment. There is no special care after treatment. Some people experience a temporary redness or minor swelling after treatment, this usually resolves within 24 hours. Good skin care and sunscreens are recommended as part of your regular skin care regimen, your practitioner will advise. Some people experience mild redness (similar to a sunburnt look), but this usually disappears quickly. Most people find that they can return to work immediately after treatment. Swelling is common and expected, with bruising a possibility, and in rare cases a haematoma (collection of blood under the skin) may occur. Damage from the heat is possible, even with cooling; however hyper- or hypopigmentation (increase or decrease in skin pigmentation) is usually very rare since the damage to the upper levels of the skin is very little to none. There have been anecdotal reports (further studies and more available data is needed) of the occurrence of fat loss, particularly with the earlier devices and treatment protocols. The theory is that the RF heats up and damages the fat cells and causes them to burst and eventually be absorbed, leading to fat atrophy (sunken areas). Normally a single treatment is enough to produce results in the majority of people; however your practitioner will be able to determine a course of treatments specific to you and your needs. Private costs for Thermage treatments depend on the area(s) being treated and can range from approximately £1,500 - £2,000 for the forehead and eye areas, £2,500 for the jaw and neck areas to £3,000 - £3,500 for the whole face. Body treatments start from approximately £3,500+. The tips only work for a certain amount of pulses and are sold for single patient use only, along with the return-pad; therefore these costs are often factored into what your practitioner charges. "Skin Laxity Improvements Seen Vividly in Neck Areas"
Guttman, Cheryl. (featuring Tina S. Alster, M.D.). Cosmetic Surgery Times; May 2003. "Device Makes Treatments Quick, Effective"
Helwick, Caroline. (featuring Richard E. Fitzpatrick, M.D.). Cosmetic Surgery Times; May 2003. "Facial Tightening Device Gives Patients Alternative to Surgery"
Reiman, Patty. (featuring Richard E. Fitzpatrick, M.D.). Cosmetic Surgery Times; April 2003. "RF Heating Promising for Skin-Tightening, Browlifting"
Guttman, Cheryl. (featuring Richard E. Fitzpatrick, M.D.). Cosmetic Surgery Times Vol. 5, No. 7 (02); August 2002. "Radiofrequency Device Offers Advantages of its Own"
Groves, Nancy. (featuring Brian D. Zelickson, M.D.). Dermatology Times Vol. 23, No. 7; July 2002. For more information please visit the manufacturer`s website www.thermage.com. Thermage™ is trademark of Solta Medical. Click for ALL Thermage ® clinics in the UK & Ireland registered and verified by Consulting Room. 1 out of 5 based on 3 customer reviews.